These are my best meatloaf recipes in my collection. My husband, Tom, absolutely loves any style meat loaf and would have it every night. Over the years I have come across so many different recipes, they are all terrific in their own way, but these are my favorites. If your looking for dinner ideas with a Mexican cooking flair, try the Mexican Meat Loaf you won't be sorry. Mix all, blending thoroughly in medium bowl. Shape into a loaf and place on sprayed roasting rack or broiler pan, keeps the meat up out of the fat while cooking. Bake in 375 oven for approximately 30 minutes. Heat oven to 350. Cook bell pepper, shallots and garlic in oil in medium skillet over medium heat 6 minutes or until tender. Cool. Gently combine bell pepper mixture and all remaining ingredients except 1/4 cup of the cheese in a large bowl. Place in 8x4-inch loaf pan; bake 55 to 60 minutes or until internal temperature reaches 160 degrees. Sprinkle with remaining 1/4 cup cheese during last 5 minutes. Let stand 10 minutes before slicing. Top with sour cream and salsa (optional). Combine ingredients except tomato sauce in a large bowl; add 1/2 the tomato sauce. Mix thoroughly. 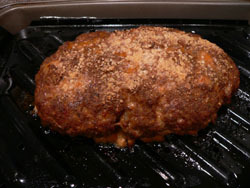 Shape beef mixture into a loaf and place on a broiler pan coated with cooking spray. Bake at 400° for 20 minutes. Brush top of meat loaf with remaining tomato sauce. Bake until done for a total of 30 minutes. Tip: Cooking light? Make this recipe with Fat Free Hot Sausage and use only the egg whites. Tip:Line the bottom of the broiler pan with foil for quick and easy clean up.